As I may have mentioned somewhere, I was down for the count last week with gastroenteritis (a fancy way of saying basically, I had the stomach flu/food poisoning/my tummy hurted). Boo. Double boo was the fact that for months now, BF and I have had weekend passes to the New York Comicon, and damned if I was going to let my tickets go to waste! (Again, I have never hidden my ultra dorkiness from anyone; in fact I embrace it!) Though we did wind up skipping Friday night (which, looking back, was kind of silly), we did attend both Saturday and Sunday, and needed to eat lunch somewhere I could find something I wouldn’t barf right back up. 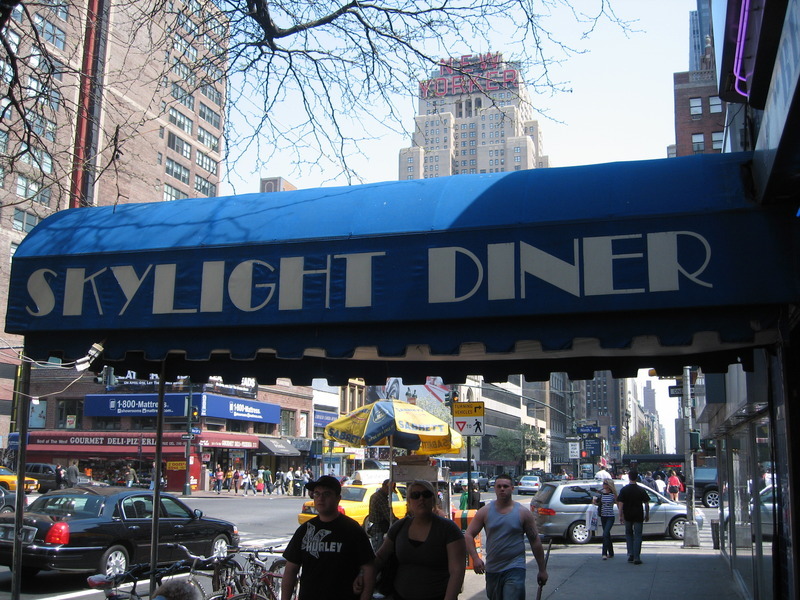 Thankfully, we noticed this diner on our trek crosstown from the subway to the Jacob Javits Convention Center, and BF gladly agreed. A few points to note: BF isn’t always the most adventurous culinarily, so a diner seemed a good choice even had I not been sick; I wasn’t going to review it until I saw an award hanging up from TONY magazine that proudly proclaimed this the best diner in Manhattan (given its slightly off the beaten path location, that’s something to notice); and we went back the next day to try more stuff because I was feeling better, and because we’d liked it the day before. Much like myself, oftentimes going to a restaurant of a particular type, BF likes to get an old standard to compare it to other places. His lunch standard is tuna on white toast and fries. (I find it kind of funny that this has been his standard for ages upon ages, yet when I met him, he claimed he didn’t eat seafood of any kind. At all. He didn’t consider this seafood. It’s fish! Straight up fish!) 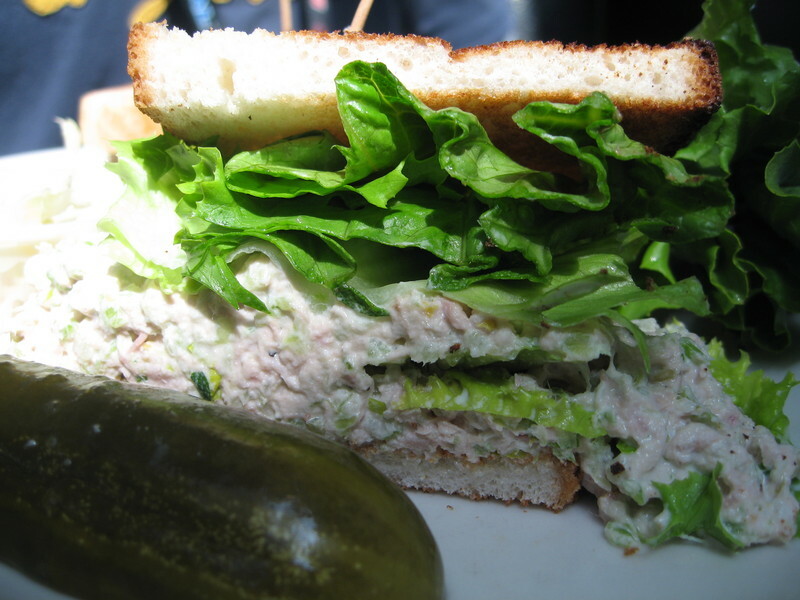 In any case, as is the usual, he scooped off a lot of the tuna to flatten out the sandwich a bit to eat, and I tried some of the tuna salad he scooped off. A lot of tiny celery bits scattered throughout, but not quite tangy enough for me. Good, but not the best. (Mine is the best– that’s not even the best version I’ve come up with!) BF really enjoyed it. As I mentioned, I was still getting over something with my stomach, but the doctor had listed out what I could eat and what to avoid. I debated soup, but the weather on Saturday wasn’t very soup-enticing- it was GORGEOUS out!! !- plus I felt like soup would be oily and I really wanted to avoid oily foods. 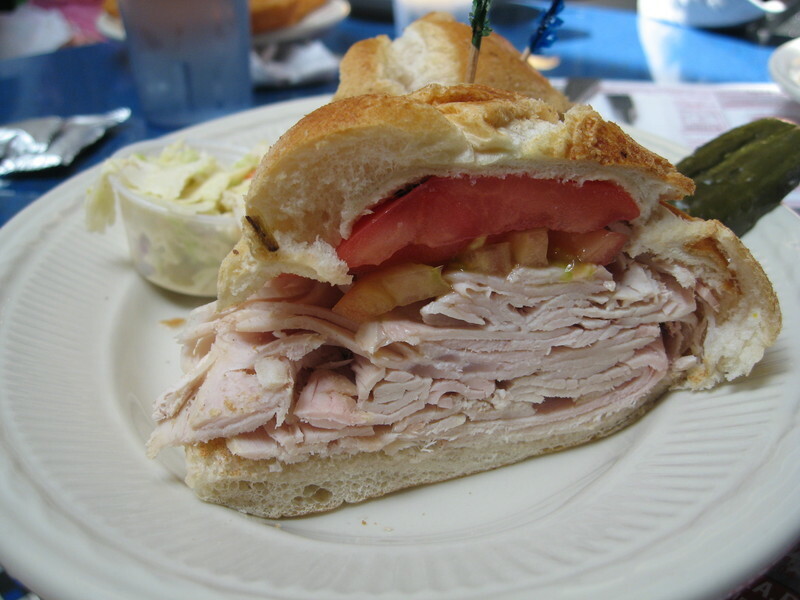 It finally occurred to me that he’d said, very specifically “Or, a turkey sandwich…” so I jumped on that, though I never order cold cut sandwiches at diners. On a roll with tomatoes, mayo, and my pickle, I was pretty happy, though the turkey by itself proved to be pretty darn dry. Nothing that can’t be fixed with a swipe of mayo, however, and some juicy tomatoes! I actually couldn’t finish and took half home, which was a delicious breakfast the next day before heading off to Comicon once again! This picture looks like I used flash. 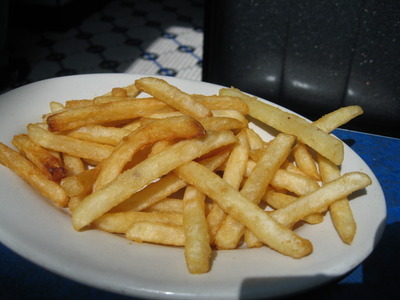 But if you look in the previous picture’s background, you’ll see the plate of fries in a bright spot of light. Though I didn’t look up, based on how much natural light there was in the place, though we sat in the middle of the restaurant, I’m going to assume there really is a skylight from whence it gets its name. Anyway, the fries were deep fried to perfection. 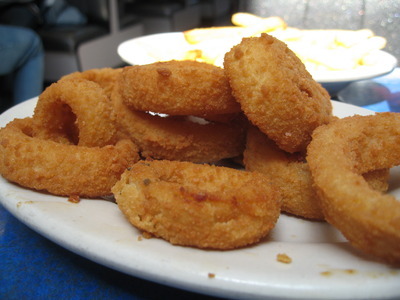 They really know how to fry stuff here, crispy and yummy. The next day, we returned for a noonish breakfast. 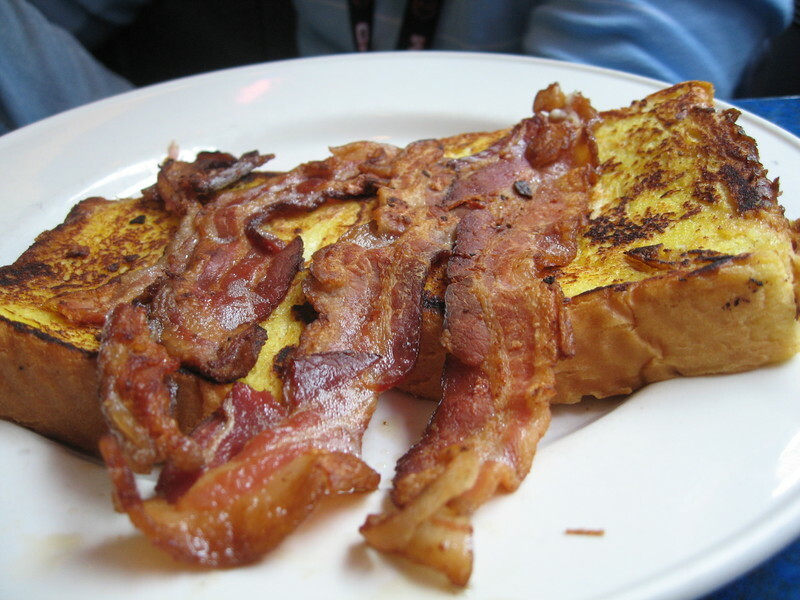 BF’s breakfast-diner-standard is French toast, bacon well done (he hates squishy fat… the part I love). Since I was feeling so much better, I decided to try something I’ve never had before (ever, in my life): blueberry pancakes! The center, as I suspected it might be, from reading stories of fresh fruit pancakes, was raw and goopy when my plate arrived, though the pancakes were not hot. 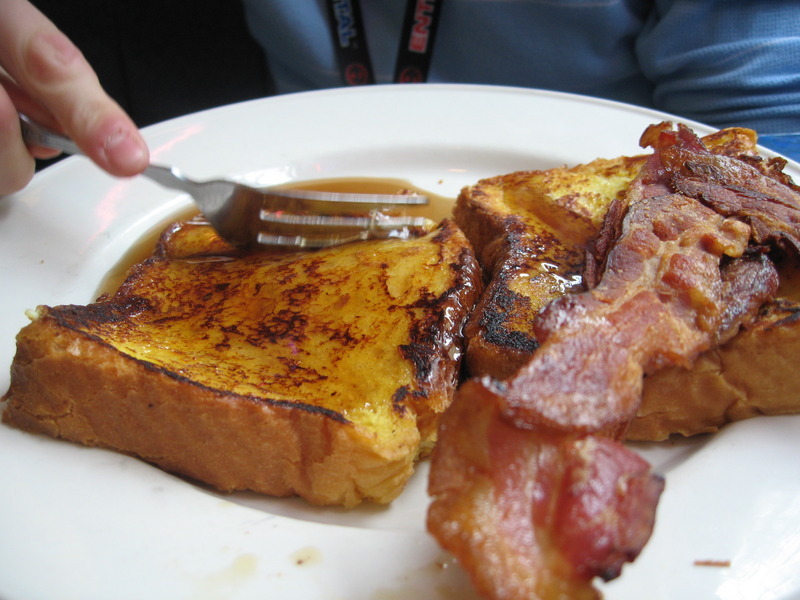 BF enjoyed his French toast very much, unable to finish from how full he was, and usually he licks his plate clean. So I’m guessing the portion size was giant, which made him very happy. 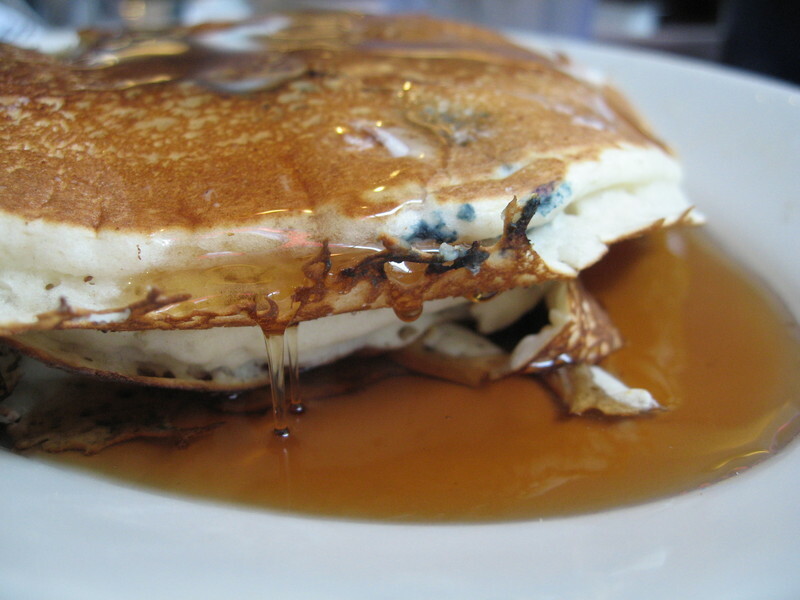 I ate around the goopy raw batter part – it solidified in a few minutes from the “heat” which I found so odd since the pancakes were NOT hot. They would have been better had they been served a bit hotter, though. 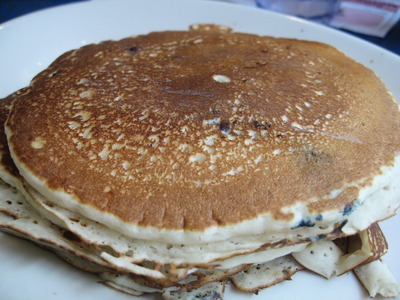 However, they were still pretty tasty, and fresh blueberries were good, better with syrup. I think if they tried harder to spread out or more evenly space the blueberries, instead of just plopping a bunch in the dead center, they would have cooked more thoroughly and been better. I understand, however, that to cook through pancakes with fresh fruit like that, you probably want a lower heat than most diners keep their griddles for practicality purposes, so I think in the future I will avoid getting fresh fruit pancakes with the fruit IN the pancakes like that (at diners; I can make them at home instead, though!). The edges of the pancakes were fluffy, crispy around the very edge, and very tasty. Yvo says: I can see why they’re rated best diner: the entire space is very open, light, and clean, unlike most diners you’d go to. The service was brisk but not rude or negligent, and the prices are totally reasonable, in the range of a normal diner. I would definitely go back were I in the area; BF may even become a regular since he works a few avenues away (though he does personally really enjoy Stagecoach Deli a LOT- despite the crap-shoot service and sticky floors/dirty tables, and it’s a LOT closer than Skylight! doh! ).